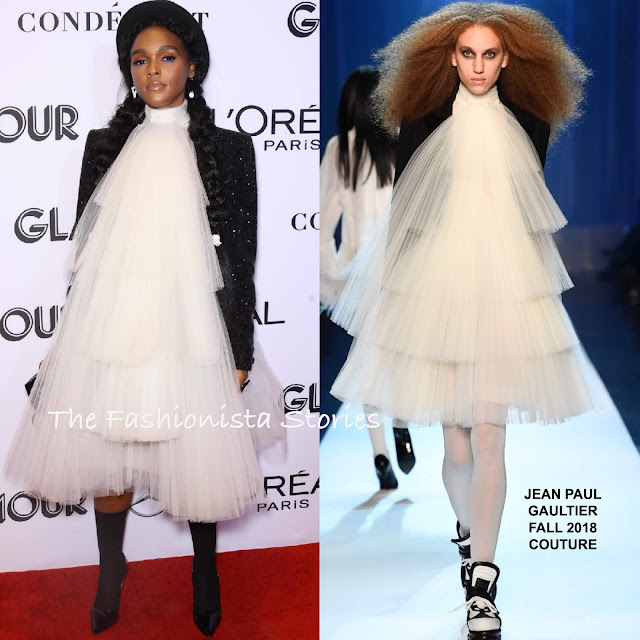 As one of the honorees, who was also featured on the November 2018 issue, Janelle Monae attended the 2018 Glamour Women of the Year Awards at Spring Studios in New York yesterday evening(November 12th). Working her signature hues black & white, she wore a JEAN PAUL GAULTIER FALL 2018 COUTURE black beaded jacket and a white pleated tier halter dress. Her look was accessorized with a black hat, a CHANEL clutch and black shiny pumps with sheer socks. Honestly, I will never get tired of seeing Janelle in black and white hues because every time she keeps it fresh. For me, this is flawless, head to toe. What do you think of Janelle's look?